This week I learned about Model-based RL where a model of the dynamics of the environment is used to make predictions. Previous algorithms that I’ve studied have been model-free where a policy or value function is being optimized. Instead, Model-based RL predicts what the environment looks like, and it can create a model that is independent of the task you are trying to achieve. The dynamics model can be implemented using a Gaussian Process, a Neural Network, or other methods. One advantage of model-based RL is that they require fewer samples to train compared to model-free. According to Sergey Levine , model-based RL requires 1000 times fewer samples than a model-free learner like A3C. I implemented the CS294 Homework 4  to understand the interaction between the Neural Network, Model Predictive Control, and data aggregation. The environment was a MuJoCo HalfCheetah simulation in OpenAI Gym. An average return of 1430 was reached after 15 iterations. The new class adds the position of the HalfCheetah’s torso to the observation data. The paper  uses a neural network for the dynamics model with two fully-connected layers of 500 units each and a ReLU activation. When fitting the dynamics model, normalized state and action pairs are input, and the state differences (or deltas) between the input state and next state are output. By predicting a change in state, rather than just the next state, the dynamics model can predict over several timesteps instead of just one timestep. The mean squared error between the predicted and expected state deltas is minimized during training with the Adam optimizer. 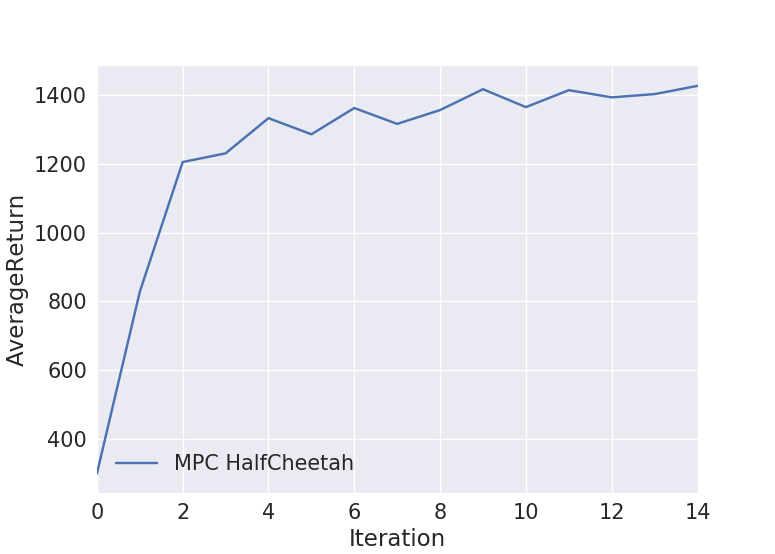 The reward function was provided in the homework code, and was a combination of the location of the HalfCheetah’s leg, shin, and foot position. The Model Predictive Controller(MPC) selects an action for a particular state by first generating ten simulated paths each with a horizon of five actions into the future. The next state is predicted using the dynamics model. The candidate paths are evaluated using the reward function and the best performing trajectory is selected. The first action of that trajectory is then performed. When ten samples are completed with the MPC, the new data is then aggregated into the dataset. This completes the first iteration. For the next iteration, the dynamics model is refitted to the new data, and new samples are again generated using the MPC.